Increase your booth traffic and brand awareness with distributors before, during and after the show! According to a study conducted by the Center for Exhibition Industry Research, sponsorships can increase booth traffic by 104%- generating more traffic, more leads and more value for your marketing dollar. Optimize your exhibiting investment and increase your ROI by choosing the perfect pre-made package, or create your own from the multitude of “tested and approved” options to best support your brand! Grab the attention of thousands of distributors BEFORE, DURING and AFTER the show to increase your return on investment. 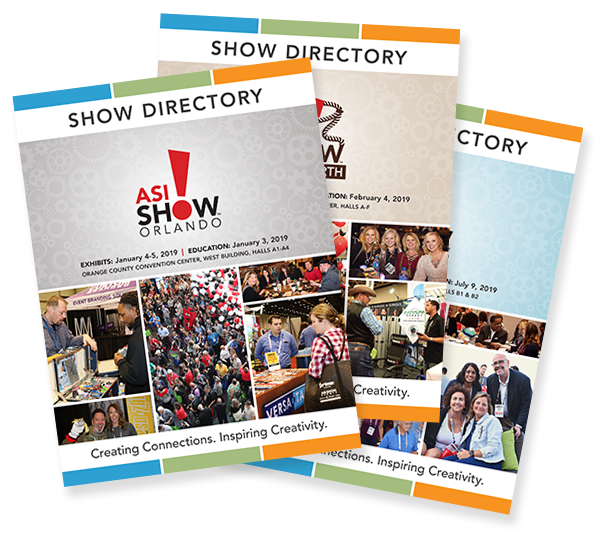 The ASI Show Launch Packages are proven to brand your company, bring traffic to your booth and maximize the return on your marketing investment. The Traffic Builder Email is a great way to reach pre-registered distributors. It’s easy! Simply send us your promotional message featuring your booth number and show specials (in an HTML or text format) and we will deliver your email to all pre-registered distributors who have given us their email address. It’s a great way to get distributors to put you on their “must-see” list! After walking the show floor, distributors head home with countless catalogs and samples. How can you get yours to the top of their pile? 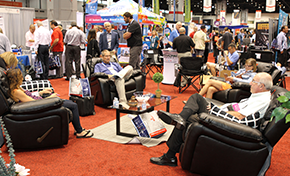 ASI Show offers cost-effective ways to make sure you reach every attending distributor company — even the ones you may have missed. Simply send us your promotional message (in an HTML or text format) and we will deliver your email to all attendees who have given us their email address. View the 2019 Flip for Savings coupon book. Increase sales and market share with the Flip for Savings coupon book! Include your promotion in the 2019 Flip for Savings Guide! This Flip Book has hundreds of views per month and will be posted on the ASI Show website and emailed to distributors throughout the year reminding them to review for special promotions. We will post the coupon book on the ASI Show home page where distributors can search for discounts and promotions all year as they are added! Make sure your promotion and special offer is included today! Video marketing is trending, and this is your chance to take advantage of this hot new opportunity. Send us your 30-second video and we'll host it on the ASI Show website, before, during and after the show, affording you regular brand exposure for 12 months. You'll be able to display your products to thousands of distributors! Stay top-of-mind with distributors before, during and after the show with the high-profile, yet cost-effective Launch Packages. A Pre-Show Traffic Builder Email: Send us a promotional message featuring your booth number and show specials and we will deliver your email to all pre-registered distributors who have given us their email address. A Post Show Email Blast: Right after the ASI Show, send us a message for those distributors who visited your booth. Within seven days, each attendee you met with will receive your customized email. An Item in the Product Showcase: Display your hottest new item in the Product Showcase located right outside the show floor. Stand out with a full-color photo on your ASI Show Mobile Application Product Showcase Listing. Display of product with headline, company name, asi number, booth number, and 100-character description on display card. Free listing of product in the Product Showcase Mobile Digest. Call attention to your made in the U.S.A., Green/Eco-Friendly, Prop65 Compliant, Express Ship Product (products that ship within 72 hours, or Always in Stock - On hand inventory/products that are in stock all the time with a special card that will be placed with your items to make sure they stick out from the crowd! Plus, you can feature your products in an Exclusive Showcase Display. This special display case will feature only YOUR products for distributors to see. Call your ASI Show account manager to learn more. 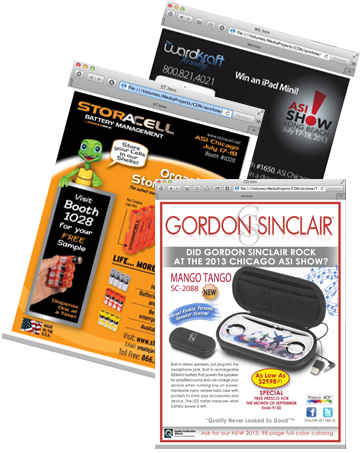 Each day new distributors visit the ASI Show website looking for more information on the hottest events in the industry. 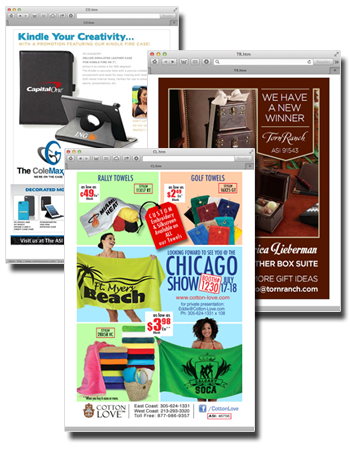 Grab the attention of these clients and prospects, when you feature your company and products on a web banner ad. Not only will you increase the number of distributors who visit your booth at the ASI Show, you will also drive additional traffic to your company's website. Home Page Banner Ad (3 available per month) This ad will be featured on the ASI Show home page. To add extra excitement, your ad may be animated and include a link directly to your own web page. Home Page Video Ad (4 available per month) This video ad will be featured on the ASI Show home page. Show Specific Banner Ad (3 available per show) This ad will be featured on each show specific home page. To add extra excitement, your ad may be animated and include a link directly to your own web page. Show Specific Video Ad (4 available per show)This 30-second video ad will be featured on each show specific home page. Registration Banner Ad (2 available per show)This ad will be featured on the ASI Show Registration page. Host a raffle at your booth to increase traffic! We'll announce your raffle in the show daily, mobile alerts and in the pre-show email blast to create excitement around this event. Additionally, signage in registration will announce your booth number and the time that your raffle is being held! Limited to 4 raffles per show. This is a proven way to attract hundreds more distributors to your booth! Every attendee receives the ASI Show Passport Plus with their badge. 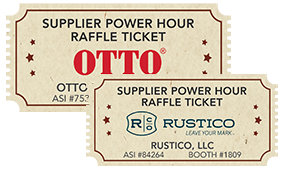 In order to be eligible for thousands of dollars in exciting prizes, distributors must visit your booth, learn more about your products and receive a special stamp from you. The Passport promotion is a favorite among attendees, and is heavily promoted both before and during the show! Attendees who complete their passport qualify for free shipping of catalogs — and you get all the credit! You will receive a Passport Plus logo which can be used in your pre-show marketing to increase traffic to your booth. Your four-color company logo, asi number, booth number and brief tagline are promoted on the Passport Plus. Your booth is highlighted as a “Passport Plus Exhibitor” on the Directory Floor Plan and in the mobile app. You receive a 11x17 “Passport Plus Exhibitor” sign with your question prominently displayed in your booth. For the low price of $699 your video promotion will be displayed in front of distributors before, during and after the show. Use this unique opportunity to promote your company, products or show special when you take advantage of the new Showmercial. On the ASI Show website prior to the show. With 10,000 unique visitors each month, there is no better way to get on a distributors “must see” list. Your video ad will be linked directly to your company’s website. Your company name will be in the spotlight before and during the show with this amazing video combo! Just one 30-second video (as created by you) will garner views from thousands of distributors. 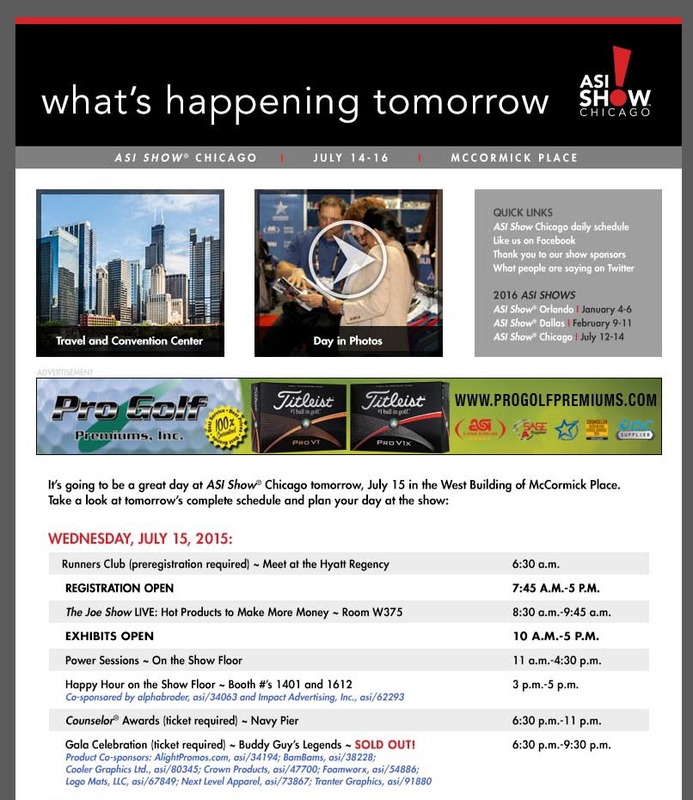 On the ASI Show website prior to the show! Linking directly to your company’s website, your video will enjoy a high-profile position (10,000 unique visitors visit each month!) and ensure more distributors than ever will visit your booth. Within a promotional loop played on the big screens located at the beginning of Keynotes and high-profile education classes! You’ll have distributors unwavering attention while they wait for show events to begin. As part of your listing within the Product Showcase Mobile Digest! All show attendees can download this user-friendly app to their Smartphone. Each exhibit day the ASI Show Electronic Daily, featuring up-to-the-minute coverage from the show, is sent to 10,000+ distributors within a 90 mile radius of the ASI Show. Promote your company, products and booth # in a banner ad featured at the top of the Daily. Ad will be featured each show day. Attendees refer to the Show Directory non-stop as they navigate the show floor, and continue to use it as a business reference long after the show is over. All exhibitors are listed within the ASI Show Directory for free. For a small investment, you can enhance your standard company listing with various advertising options and grab the attention of distributors to increase booth traffic. Stand out from the crowd, increase your booth traffic and grow your sales by taking advantage of this EXCLUSIVE marketing opportunity. Placing a 16x18 inch belly band around the directory is an effective way to get your message in front of EVERY attendee as they must remove the band to open the directory. Your full-color ad will be read from front to back, keeping you top-of-mind as distributors enter the show floor. 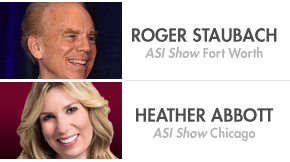 Enjoy real-time access 24/7 to the ASI Show with our brand-new mobile application. 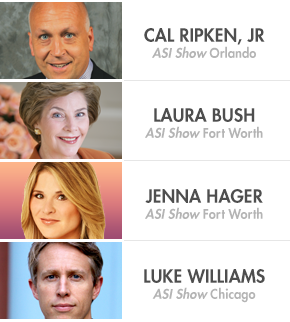 Distributors use the ASI Show mobile application to plan their show schedule and create their must-see hit list. Search for exhibitors by name, product category and more. 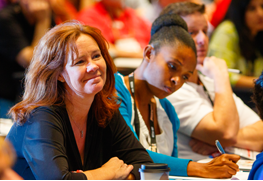 Peruse the show schedule by date, education track or speaker. Create your personal agenda, including classes and networking events. Look up course descriptions and speaker bios. Learn more about the items featured in the Product Showcase. Find booth locations on the exhibit hall floor plan. Check out live coverage of the show on Facebook, Twitter & Flickr. Receive important reminders and show alerts. 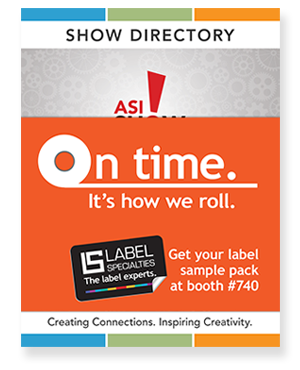 While all ASI Show exhibitors are automatically included in the app, you have an opportunity to grab the attention of attendees by adding your logo or sell sheet to your company listing or featuring your show special in a banner ad. Want to take a quick test-drive? Official ASI Show Sponsors receive 56% more leads than all other exhibitors! The additional recognition you receive by being an ASI Show sponsor will increase your ROI and guarantee you have the best show experience possible! A high-profile listing in the ASI Show Directory and ASI Show Mobile Application with a special “Official Sponsor” logo (in the exhibitor listings section). Your full-color logo included on the ASI Show Sponsors Board in the busy Registration area of the show plus, an electronic ad included on the sponsor board video loop. Your full-color logo on the ASI Show website’s Official Show Sponsors page. A 4’ x 8’ banner hanging above your booth. Download a fact sheet for Fort Worth or Chicago. Fort Worth: Roger Staubach, a former Dallas Cowboys quarterback and successful businessman..
Kick-off the first day of exhibits at this ticketed breakfast and have the opportunity to network with distributors and talk about your products and services before the exhibit floor opens! On Education Day, from 1:00 p.m.-2:00 p.m., you will have the opportunity to have lunch with distributors who are attending education sessions. During this lunch, you will rotate from table to table in 8-minute time frames where you can hand out products, share your knowledge and have them meet you before they even hit the show floor! You'll be introduced as the host of the session and will be able to welcome distributors as they enter the room and mix and mingle with them at the end of the session. Strategically located, the Refresh & Recharge Zone gives you an additional area of exposure on the show floor where you can display your products outside of your booth. Having your products in a different location on the show floor is a great way to draw distributors to your booth so you can have an in-depth conversation about all of your products and services. In a table top setting, on Education Day from 5:00 p.m.-6:00 p.m., you’ll have the opportunity to display your NEW products to distributors who attended Education Day. At the reception, over cocktails and light food, you’ll have the opportunity to present your products and network with attending distributors the evening before the show floor opens. Bring your company’s newest apparel to life. The Fashion Zone is an exclusive area on the show floor where your newest collection will come to life. The area will be strategically located to optimize floor traffic, giving you a unique opportunity to dress a mannequin in your newest styles. 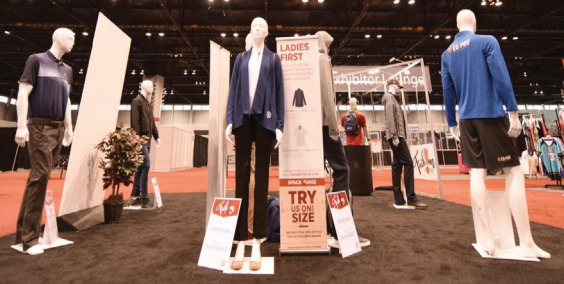 What better way to have additional exposure OUTSIDE of your booth, giving attendees both the chance to touch, feel and see your designs in action and a great reason to visit your company’s booth on the show floor. 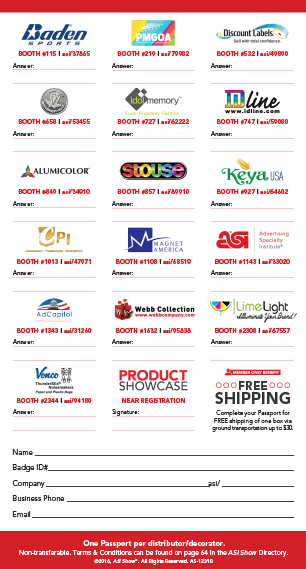 Your full-color logo featured on the ASI Show Directory’s Official Show Sponsors page. Your full-color logo included on the ASI Show Sponsor Board in the busy Registration area of the show plus, an electronic ad included on the sponsor board video loop. 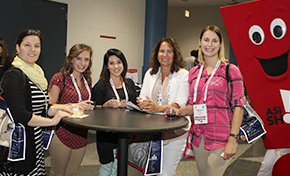 Become an education sponsor at the ASI Show and enjoy prominent name recognition during the industry's largest live education conference. All workshops qualify for points toward the ASI Certification Program, guaranteeing strong education attendance all three days. 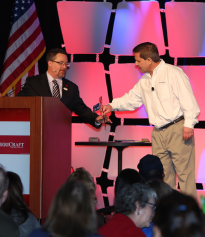 ASI Show networking and Keynote events are a "must attend" among distributor attendees. You'll be able to promote your company, products and show specials at these popular activities. 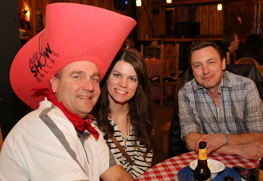 Distributors will stop by your booth just to say "thank you" for making these events possible. An exclusive opportunity available only in the first tradeshow of year at ASI Show Orlando, showcase your hottest, new item to a captive audience of enthusiastic and motivated distributors — and drive more traffic to your booth! Sell to Win, hosted by Joe Haley,takes place the morning of the first exhibit day before the show floor opens and allows you tell your story and present your products to hundreds of distributors! There is no better way to increase your show profile than by associating your company name with one or more of the amazing Keynote speakers we’re featuring in 2019. In fact, research shows that event sponsors receive 56% more leads than other exhibitors — that’s an amazing return on investment! Your full-color logo featured on the ASI Show Directory’s Official Show Sponsor page and on the ASI Show mobile application. A high-profile listing in the ASI Show Directory with a special “Official Sponsor” logo (in the exhibitor listings section). Your full-color logo included on the ASI Show Sponsors Board in the busy Registration area of the show plus, an electronic ad on sponsor board & show entrance units. A distinctive 4’ x 8’ banner hanging above your booth. Your name and full-color logo on the ASI ShowWebsite’s page dedicated to your event. Your full-color logo on the ASI Show Website’s Official Show Sponsor page. Your full-color logo featured on signage at the event and on the podium and big screen at the front of the room (if applicable to room set up). 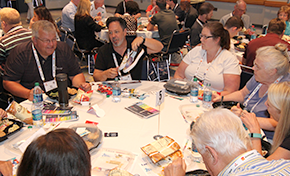 The opportunity to distribute product samples and catalogs to event attendees. From initially registering for the show, to visiting Registration on site, to wearing a badge – this opportunity is the perfect way to get your company name in front of thousands of distributors multiple times. What better way to get your new, hot items in front of distributors than by being a part of this opportunity! Products are given to each attendee in the show bag they receive upon picking up their badge. Products include lanyards, bags, pens, lip balm, pencils and mints. Other ideas are welcome. Call your ASI Show account manager with other product ideas. Give your brand the extra exposure it deserves by displaying your products in a second location in an exclusive display case. Located outside the exhibit floor in a high traffic area these cases allow you to spot light your products and company which will drive traffic to your booth. Private meeting rooms are the only true option for closed-door meetings at any tradeshow. When you want to meet with key customers and prospects to discuss new products, your services and how you can help to increase sales, a private meeting room is always the best bet. This escape from a busy tradeshow floor is often viewed by attendees to be a more personalized experience than they encounter at other booths. Hold staff meetings, and invite distributors to a designated space for presentations and set yourself apart from competitors who may not have one!